Zoho CRM has helped thousands of businesses close more deals by simplifying their processes from day one. Our training program aims to provide your salespeople with skills and techniques to engage with prospects across channels, and close deals the smarter way. Looking for Online or Onsite training? 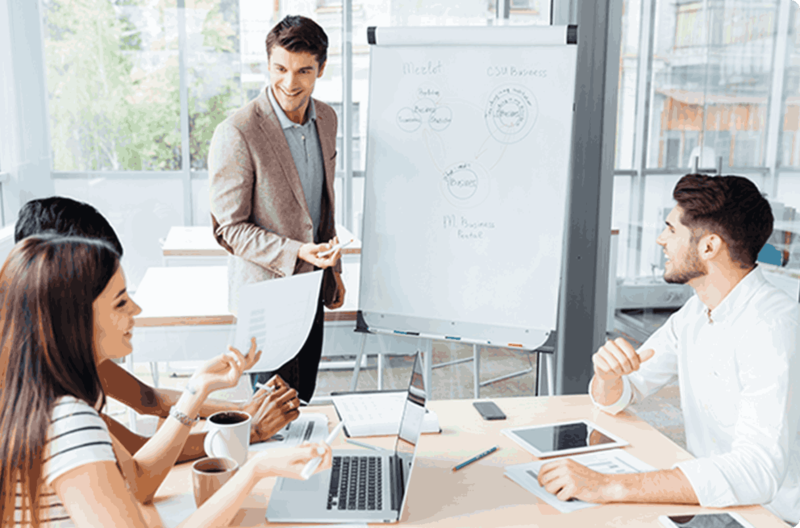 For a training package that suits your organization's individual needs, we can work together and come up with a course that is tailored to your specific training requirements. Known for his quality of customer service and love for problem solving, Ganesh enjoys interacting with customers as much as he enjoys a bike ride along the Chennai sea coast. Dhinesh has more than 12 years of experience in pre-sales, consulting, and customer service. He always has a smile on his face and very well knows how to handle his client and colleagues. Vaagdevi is part of the User Education team in Zoho CRM. When she is not creating CRM training material, she is either tweeting, singing or traveling. With a strong experience in teaching, Sampath adds great value when it comes to training customers. He is constantly dabbling with new ideas and scenarios, making sure he explains the most intricate of features in a simple way. With over 8 years of experience, Sandeep has a real passion for training. According to him, good training is not just teaching customers about features–it's about helping them figure out how to effectively use Zoho CRM as a solution to business challenges. I liked that the trainer had a test environment for us and that he had us do exercises in class. He asked us questions that made us stop and think about what we knew. Very comprehensive. Covered all of the topics that I was interested in. The teacher was very personable and well-informed. From visiting a new city, entering a new workplace, or learning new software, new experiences are certainly exciting, but can be equally puzzling. If you’ve just purchased Zoho CRM and are wondering “what's next?” this training program is for you. The Zoho CRM Training Program is designed to offer our customers a dedicated platform to learn directly from specialists on how to leverage Zoho CRM to the fullest extent. The courses in this program cater to different sets of users categorized based on their role within an organization: sales representatives, sales managers, developers, and CRM administrators. All courses are structured, led by dedicated trainers, and are designed for quality, hands-on learning. By the end of the training course, you will be equipped with the knowledge and tools needed to implement all of the capabilities of Zoho CRM for your organization. We encourage you to consider attending this program so that the fog clears. We want you to feel confident in the investment you’ve made in a system that addresses the sales and marketing challenges within your company. The Zoho CRM Classroom Training is a 3-day instructor-led program, which aims to enable CRM Admins to set up and run their organization account efficiently. In this training, we'll take you through the basics of setting up an account on Day 1, to more advanced features such as automation, process management, and module customization towards Day 3. This training is highly recommended, as it includes hands-on sessions, technical demonstrations, and more. You'll also receive participation certificates and learning materials by the end of the training. Note: Classroom training follows a specific course outline and will not be personalized. Through Online training we offer a more customized approach to learning Zoho CRM. You can inquire about this training by filling out this form. Our training team will reach out to you with a customized course plan according to your organizations' needs. We host classroom training sessions year-round in cities across the world. However, if you'd rather have us come to you, we'll fly out our experts to your company to deliver a training program tailored exclusively to your business. To inquire about onsite training, fill out this form and we'll reach out to you within 12 hours.